Quinoa is an ancient grain-like seed cultivated by the Incas over 5000 years ago. It is a superfood, full of phyto-nutrients, antioxidants and can help balance your blood sugar. Not only is quinoa extremely versatile to cook with, it is also easily digestible and packed with high quality protein and fibre. Most importantly, it’s totally yummo. 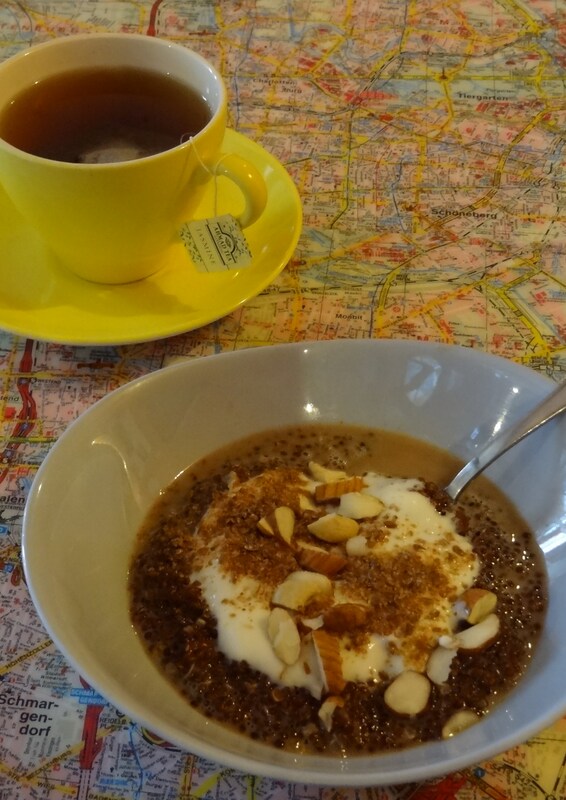 I make this porridge all year round in many different variations, depending on mood and season. I like to add a zesty orange-infused dried fruit mix from the bulk bins in the supermarket (thanks to our beloved Alison Holst) consisting of cherries, goji berries, golden sultanas and cranberries. You can add whatever you feel like on the day to the porridge, like fresh, frozen or dried fruit and berries etc. The dried fruit is added at the beginning of the cooking process and the fresh and frozen fruit slightly later on. There are different types of quinoa, including red, black and the standard cream colored variety. The red variety is slightly crunchy, has a mildly bitter flavour and also needs to be cooked for a few minutes longer than the standard variety. I usually make quinoa porridge at night whilst I’m preparing dinner and have the time to keep an eye on the pot, as it requires a stir every five or so minutes. I simply reheat it in the morning and add a dash more milk if needed. I generally use oat milk, but you can use any milk that takes your fancy. This serves two people, but double, triple or even quadruple the recipe to your heart’s content. Rinse quinoa thoroughly in a fine-mesh strainer under cold running water. Place in a small pot and cover with milk. Add cinnamon, salt and dried fruit. You can add fresh or frozen fruit now or slightly later during the cooking process if you prefer. Slowly bring to the boil and leave to simmer for 15 minutes, stirring every 5 minutes or so. Take off the heat and put the lid on, allowing porridge to sit for a further 5 minutes. Serve with yoghurt, ground flaxseed and raw nuts for a breakfast that packs serious punch.